More control over CSR resources is announced… lets not forget CSR is VOLUNTARY! Government. Prepares formal indictment against the alleged perpetrators of privatization. The government announced the regulation and legislation on the use of resources under Corporate Social Responsibility (CSR) so that they are not employed in the financing of political campaigns, and charged that the former presidential candidate for Democratic Unity (UD), Samuel Doria Medina, he used the funds of the company Sociedad Boliviana de Cemento (Soboce) as booty for his electoral campaign for the general election of October 12 . They enforce CSR obligations. Acting President Alvaro Garcia Linera said that the fact that Doria Medina transfer their shares to a Peruvian company, is his decision, but it must be understood that there is an inherent obligation called Corporate Social Responsibility (CSR). “What we’ve learned is that what is called corporate social responsibility, which may not be a spoil of political financing; why has it happened to Soboce in recent months, all the money of social responsibility was led directly to fund a political campaign, that we will not allow to any company, any company,” he said. García Linera said he expects in a while, that the owners and shareholders of Soboce, on their own review these issues and to bring Doria Medina to trial, for economic damage they would have suffered. This newspaper tried unsuccessfully to communicate with several heads of National Unity (UN) and associates of entrepreneur Doria Medina. They begin research. 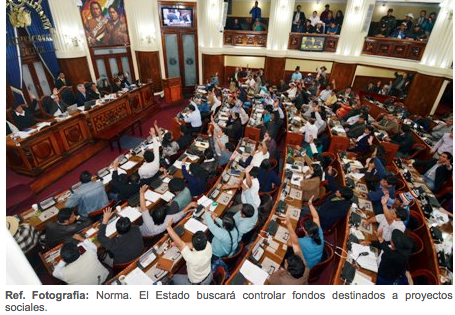 The president of the Plurinational Legislative Assembly (ALP), Álvaro García Linera, said a special committee of the Legislative conducted an investigation into the privatization process that took place in the country, and is expected to report to the plenary and to the Bolivian people. Doria Medina was planning minister between 1989 and 1993. Transferred this week’s 51.35% stake in Soboce to Cement Holding SA., a subsidiary of Gloria Group of Peru. The concept of Corporate Social Responsibility worldwide is very basic and straight forward: IT IS VOLUNTARY IN ITS NATURE! Therefore, a good government, as it happens in Denmark, has to help, motivate and encourage the private sector to be socially responsible. It is NOT the role of the private sector to do or replace the State responsibilities. Clearly, this ochlocracy ruling in Bolivia for the last ten years has LOT to learn. Although that is certainly difficult as they are old-time socialists, caudillo oriented that only want to impose ideologies and hatred that hasn’t worked anywhere in the world. Galeano said he’s sorry for writing on behalf of socialism, Cuba is now in the process to revert. Although, we are under the Anthropocene, we need to meet the needs of all society members as well as to take care of our planet. The private sector has acknowledged that is part of the society, part of the problem and the solution. And in so doing it has to be voluntary. CSR works better when a company supports people who are not directly related to their industry, voluntary process that also means that the beneficiaries will embrace the idea, bring other actors to the project, so by the time the company leaves, the project continues in a sustainable way. The private sector is the only capable to provide development assistance in a sustainable way, and has more time to work with beneficiaries. Politicians come and go, companies and society are there to stay, so it makes perfect sense to develop that relationship. If a government has the intention to force companies do projects with certain parts of society, CSR just becomes a new for of tax, and that is NOT the nature of CSR. So, the Bolivian government must stop on its cheap demagogue and follow the example of other governments around the world. This entry was posted in Bolivia, Business, Economics, Politics and tagged competitiveness, Confederation of Private Entrepreneurs of Bolivia, entrepreneur, public policy failures, social responsibility. Bookmark the permalink.